Louisville’s economic development efforts must create jobs that keep families out of poverty and those that create higher incomes to drive economic prosperity. Factors like high wage job attainment, unemployment, and affordable housing indicate the state of the job market and the ability of residents to achieve financial independence. The main metric for 21st-century workforce and talent is median wage. 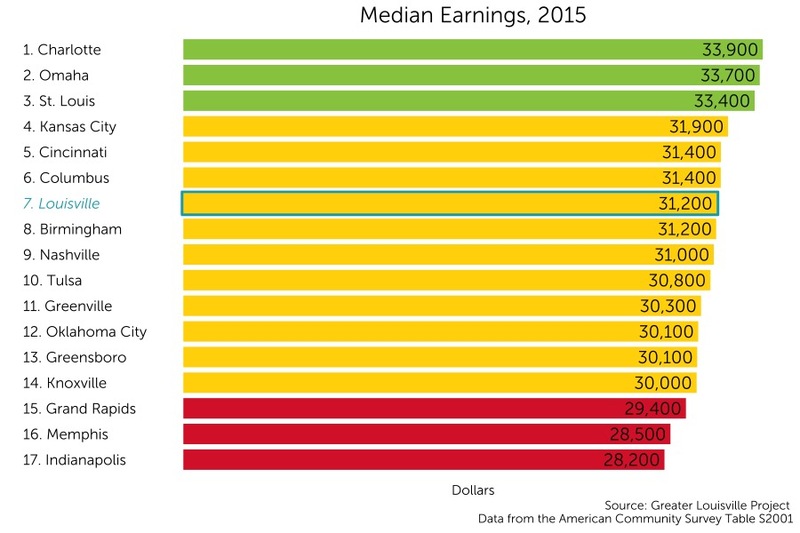 Louisville has a target goal of being in the top 50% of its peers in median wage. Louisville’s median wage of $31,202 ranks 7th among its peer cities. Louisville is in the middle of its peer group according to a natural breaks algorithm. Cities in Green are a cluster that outperforms their peers, Yellow represents the middle cluster, and Red is a group that lags behind its peers on this indicator. How does the median income vary across Louisville? Louisville’s median wage varies greatly across the city. In the map to the left, areas with higher median wages are displayed in green, and areas with lower median wages are displayed in red. Workers have higher earnings in eastern Louisville in communities such as Northeast Jefferson and Floyd’s Fork, where the highest median wage reaches $45,200. The median wage is lower in western and southern Louisville, where it is $14,600 per year in California. Median annual wages in Louisville have increased over the past decade. Following the Great Recession, wages increased steadily from 2009 to 2015, interrupted only by a large jump in 2013 and a slight decline in 2014. 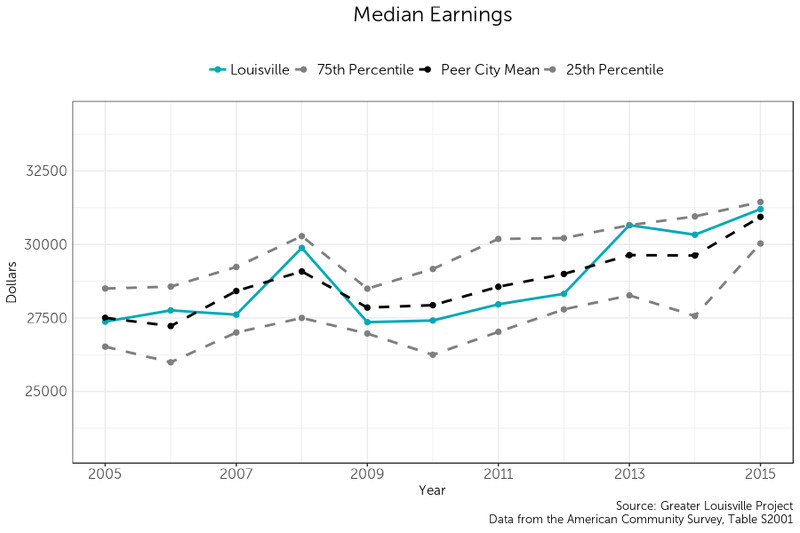 This steady increase resulted in a 14% increase in wages for Louisville residents from 2009 to 2014 and pushed Louisville’s median wage above its peer cities’.